Download a free state pattern from the Internet. Draw a small heart in the general area of the state to represent the city. This heart also serves as the anchor point for the strings. Position your enlarged state print out onto your wooden board. Tape the edges in a few places just to hold it still while you begin adding nails. Hammer nails into the pattern along the state outline. Nails should be approximately 1/2-inch apart. Hammer around the outline of the little heart. Remove the paper state pattern from the nails. You no longer need the pattern, so don't worry if it rips. Starting from the state outline nails (doesn't matter where, just choose a starting point) tie a strand of embroidery floss to a nail and add a little glue to the knot. From here you will stretch the string to a nail on the heart. Loop it around the heart nail then stretch it back to the nail next to your starting point. Be careful not to stretch the string too tight that your nails may bend, but make sure you keep it taught enough that it doesn't sag. Continue this process around the the outline of the state to the heart, back and forth. You will probably find that you need to go over nails on the heart more than once in order to keep your strings looking uniform. This is simply because there are a lot more state outline nails than there are heart nails. Continue until you have completed the entire state. Be sure to always add glue whenever you start and end a string with a knot. Allow the glue to dry completely. 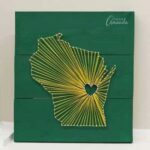 This project for Wisconsin State String Art was printed from CraftsbyAmanda.com - https://craftsbyamanda.com/wisconsin-state-string-art/ and can only be printed for education or personal use.